All the world is a stage someone famous once said. We are the actors, telling a story. 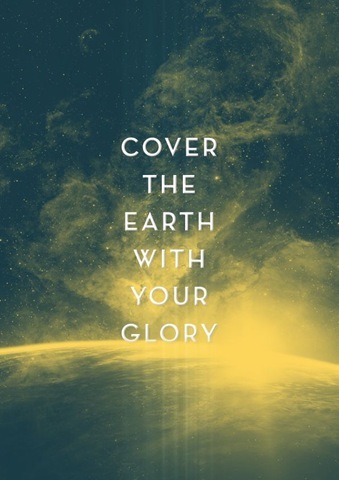 But the show is not for our own showcasing but is to bring glory to God, the Creator. Your story matters. Your part matters. Your contribution to this world matters. Only you can play it. God has crafted your life to demonstrate His reality and goodness. You have gifts and talents that only you can offer. You are uniquely fashioned and designed by God, for God. That way God’s bright presence will be evident in everything through Jesus, and He’ll get all the credit as the One mighty in everything—encores to the end of time. some of us are naturally wired to connect and talk with strangers and friends about what God is doing in our lives. but others of us are not so comfortable stepping out and sharing. regardless of who we are and how we work and are wired we are called to be witnesses and to share the gospel, with our lives and actions and with words. the awesome thing is that it is GOD THAT SAVES and the HOLY SPIRIT THAT DRAWS AND REVEALS but we are the SEED PLANTERS. we are called to share and witness and be ambassadors for Christ. and God has lots and lots and LOTS of promises that can give us confidence that as we step out His power ENCOMPASES US and STEPS OUT with us to ACCOMPLISH great things. when you step out His power is available and He empowers us. when we step out He can give us the right words to say. These promises are for stepping out. they come into effect when we step out. you get my point. so be confident. be secure. be encouraged. be inspired. God’s is ready and willing to empower you to tell the Good News of His love and grace. And there are people there that he loves. There are people there that he’s willing to forgive. There are people there that he’s willing to save. There are people there that he’s willing to befriend. There are people there that he’s willing to change. There are people there that he’s willing to be with forever in the New Jerusalem, the great city that he’s created for us. 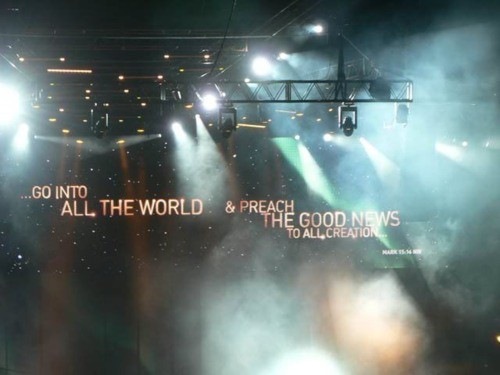 So I urge you today: if you don’t know Jesus, give him your sin, receive his salvation, and get connected to Jesus.We implore you to be connected to Jesus’ mission. i think the part that stood out the most for me today reading this familiar passage was that the lawyer wanted to justify himself. he saw himself as righteous enough, fulfilling the requirements of the law, above reproach. He knew the heart of the law, but wasn’t living it. He knew the right words, but it had not penetrated into real life and into his spirit and soul. and who is our neighbour? is it the person in the house next to me? someone who goes to my church? someone nice and friendly? it is everyone. not matter how nice they look. how nice they act. it is the marginalised, the orphan and the mean. it is the single mum and the divorcee. it is the blended family. it is the widow and the elderly. it is the kid with ADHD. it is the rebellious teen. it is the working dad and SAHM mum. it is the teacher and the doctor and the check out operator and the banker and the shop assistant. it is the undeserving and the deserving. those we click with and those we dont. its the person that sits beside us in church and the person that sits on the opposite side of church and the person that goes fishing on a sunday morning. its our workmates, school mates. and we are meant to show them love and mercy, kindness and grace. to demonstrate the love and grace and reality of God. its in the kind words, and the forgiveness and the smiles and the encouragement. its in the letting go of our rights and our offenses. its in the going out of our way and out of our comfort zone. its a life in a way without boundaries. our only boundary is love and the will of God. YES! 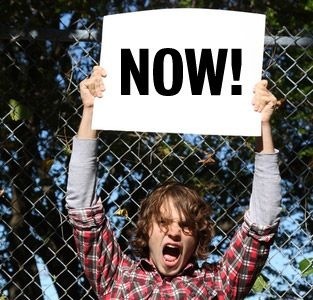 this is our time! FOR SUCH A TIME AS THIS! this is the challenge every day and every moment! our opportunities are now, in our ordinary lives. not when we make it. not when we’re called into ministry. not when we have a title. the world is crying out for truth. hope. love. grace. reality. purpose. if we blend in we dilute the testimony we have. that we WERE lost, but now are found. that we know salvation and hope and grace and love. that God IS real. and that they can too. if we keep silent how will they hear? if we live silent how will they know? God calls each one of us to live our lives out loud, to shine. to be the light of the world, just as HE is The Light of The World. to be a lit lamp shinning brightly in its right place. to glow in the dark like stars in the darkened sky. in our real lives. and online. online isnt our real life. they’re the same thing really. funny how we think just because its words in an electrical box that its not our real life. it is. and what we say has consequence and meaning and can be used powerfully to be involved in someones story of knowing God. we can do this – its how we’re made, transformed, wired! this is God’s glorious plan. flawed broken people who are undergoing grace and love shinning the reality of God’s love and healing and forgivness. wow! the great commission doesnt get turned off when we turn the computer on. its on all the time. and sometimes i think people can be more open online because there is that degree of anonymity. you dont really know me so i can speak more freely. i dont have to see your face tomorrow so i can open up about my pain and my loss and my fears and my hopes. i wont bump into you in the supermarket so i can ask fro help. what a gift we have with the internet. an opportunity. this is our time to shine. this is our mission field. this is our day of harvest. will we rise up and be intentional about living for jesus 24/7 in all we say and do? will we be open for the Holy Spirit to lead us and speak through us? will we partner with God to reach this generation for Christ? 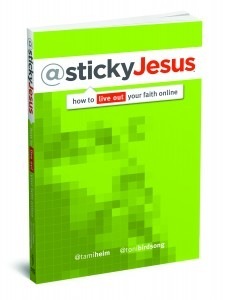 @stickyjesus is a book to fire your heart up about the mission of God… not just online but in every day life. we are ordinary people given the opportunity to do extraordinary things through the power and grace of God. our words can be His words. words that speak into hearts and breathe hope and life into situations, can draw someone to God. what a priv. what an awesome privilege. but isnt it so right. one day someone spoke to us about jesus. one day someone invited us to church. or said something that lit up in us. one day someone loved us and cared about us and shared the gospel to us. we were lost. but now we are found. we were sinners but now we are saved by the grace of God. i love God’s glorious plan, that those who EXPERIENCE His love get to share the message of it. what an audacious and bold plan! lets live it out! which is good timing as today for me it is Christmas Eve. Jesus is the reason for the season – and every day, hour, minute and moment of my life. Christmas is where we celebrate and focus on His birth – remembering with wonder and worship that Christ, the Lord, humbled Himself and was born, in humble circumstances the King of Glory entered time and humanity. Jesus split time – before His birth BC, after His birth AD. He is the greatest man in history. even TIME say that. Jesus was a carpenter, used to working with his hands, lifting heavy beams of wood, using his whole body to craft yokes for oxen and furniture for homes. When Jesus walked this earth, He didn’tt fit the expectations of the religious community, or even his own disciples. He didn’t demand an ornate tower to preach from, He was born in the dust, His friends were the most controversial fringe elements of society – tax collector’s, prostitutes, lepers… Jesus touched those that were classed as outcasts and untouchables. Equally he called to those that were community leaders, soldiers, the wealthy. Jesus didn’t look at the exterior, he looked at the heart and gave everyone the opportunity to follow Him. Jesus stood up for real truth, the truth that God was real and loved them and desired to be in relationship with them. He preached real love, real commitment to holy living and real commitment and relationship with God. He talked about eternity and the way to heaven, life and death, choices. This went against the grain of the religious leaders who had made ?church? into a series of do this and dont do thats. Jesus Christ made a claim that was breathtaking in it’s audacity. Where did He come from? Was He really God in the flesh? Why was the establishment of His day so frightened by His message that He had to die? Who is Jesus to you? Your life on this earth and for all of eternity is affected by your answer to this question. 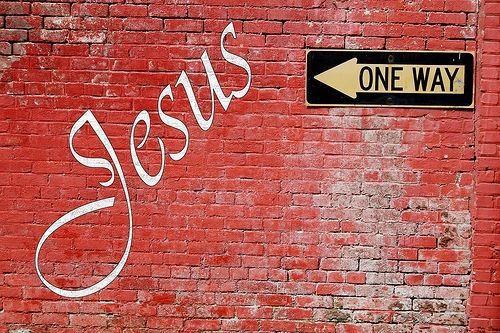 Jesus said he was the one and only way to God, both for eternity and for this life too. Will you believe what he said? Christmas is the beginning of the unfolding of the greatest revelation of love we can every know. this chapter of @stickyjesus encourages us to be aware that we are representatives of this awesome jesus and that our mission is to replicate ourselves and our lives to reveal Him. what we say – reflects. what we do – reflects. we are designed to be connected to Him and also to others. family members. friends. workmates. children’s friends. children’s friends parents. checkout chicks at the supermarket. our doctor. 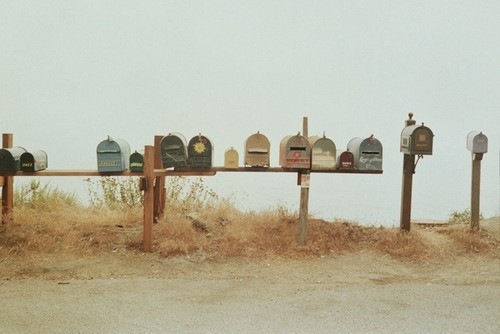 the postman. there are people in our lives all around us that God has placed there. we not just saved, we are sent. we are not just rescued, we are recruited. we are filled with Holy Spirit to fulfil His mission here on earth – that we would be living breathing demonstrations of the reality of God. God doesnt NEED you to share your faith. there’s no cape required. he’s almighty. he can touch any heart at any moment, anywhere, in any way he chooses. the glory and the gift of this holy equation is that he has called you. he’s called you out of your stunted, insular self and into a limitless and vast relationship with him. he will do a holy work in you and others each time you recount that story. now thats a transformational mission worth logging on for. Life is more than just breathing. It is more than jsut working and even more than just falling in love, raising a family etc… We need to live for today remembering that we are not just flesh and blood but that we serve the Almighty God, the King of Glory and that He has a mission for which He gave His life for. In the everything, no matter how mundane or normal it is, we do we should remember who we are – ambassadors for reconnecting people with God. Life is more than just breathing – it is about living and having adventure! The adventure and satisfaction we are born craving is found in God, in knowing Him and serving Him. today, little ol’ me on the other side of the world watched the Presidential Inaguration and Parade. i confess i was moved. i’ve always been moved by Obama and his dream and vision. i love seeing the hope rise around the world. i liked his speech. it resonates with me that we ALL have responsibility and a part to play, we all make a difference. we serve and awesome God and he calls us to change the world, wtih his love and grace. by the might of the Holy Spirit. This is one of those verses we can skip over “cos we know it.” you know what i mean eh, verses we read and skim over without thinking about because we may of thought about them 5 years ago… things that are simple and so we’ve worked it all out… i know i am like that, shame on me! but it is worth taking a look at again and exaiminng our life. does our life reflect these two MAIN THINGS – loving God and loving people? are our priorities influenced and inspired by loving God and loving people? does our time reflect our committment to these commandments? yesterday our pastors wife (she so rocks) preached about loving our neighbours. and from there i have been thinking of more practical ways that i can love those around me. simple things really. but they might just make someones day, help someone in need, demonstrate the love and grace of God, make someone feel special etc…. our neighbour is not just the person who lives next door…. it is anyone. it isnt just a christian or church member… it is anyone… it isnt just the nice people we call friends… it is anyone… including those we dont “click” with… get me….? make a meal for someone who is sick or busy or something!